These paleo carrot cake cookies let you enjoy all the classic flavors of the cake minus the grains, dairy and sugar in one healthy bite! You even get that cream cheese frosting flavor too. I feel like we all have that one food we absolutely can’t pass up if it’s in front of us on the table or on the menu at a restaurant. For my husband, it’s apple pie or crisp. For my brother, lobster ravioli (weird, I know). Oddly, I have no idea what my parents’ would be but I can tell you mine: carrot cake. Actually, I have two because on the savory side it’s duck confit. If both are on the menu, it’s like I won the lottery. When it comes to carrot cake, I’m a true fan too. Not one of those "eat all the frosting and leave the cake" kind of people. It’s the whole package of cake + frosting that gets me and it has to be the perfect ratio of each as well. Too skimpy on the frosting = no good. Too much frosting = unwanted sugar high, also no good. On the cake side, I’m not a fan of those that overdo it on the spices. I don’t want everything you’d throw into a pumpkin pie in my carrot cake. Just some cinnamon will do because the carrots need to actually shine through. It’s called carrot cake for a reason. So with all that in mind, I set out to make a paleo version of my beloved dessert in cookie form. 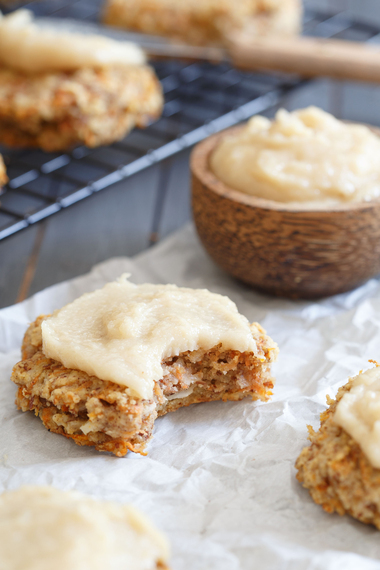 They turned out hearty with lots of carrot and coconut chew, slightly sweet and just a barely detectable note of cinnamon - perfect. The cookie was the easy part though. The frosting was a bit more difficult. Replicating cream cheese without using actual cream cheese is a bit tricky! The lemon juice in the frosting is key, it helps break up the distinct coconut flavor you get from using coconut oil and coconut butter and blends nicely with the cashews (which turn all buttery in the food processor) for a pretty good replica of the real stuff. The best part about paleo carrot cake cookies? 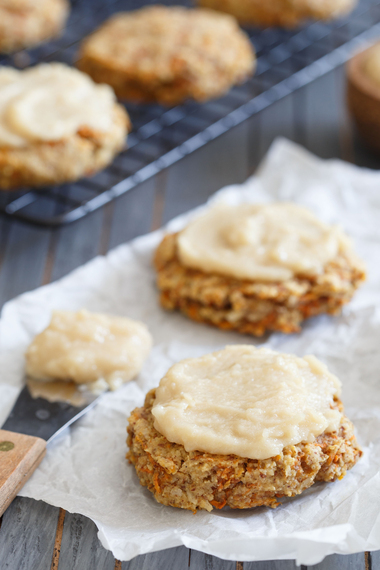 They’re so darn healthy, they don’t have to just be dessert! If you’re looking for other paleo cookies, check out these paleo lemon macaroons or these chocolate chunk paleo cookies, or even this quick paleo mug cake. Just want more carrot cake? 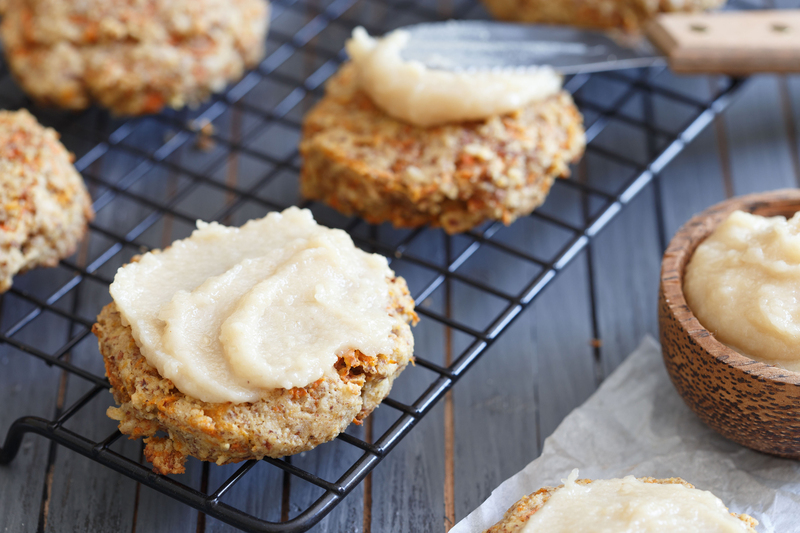 These carrot cake cupcakes fit the bill!